Crodia subcordata, known as Kou in Hawaiian, has distinctive orange flowers and large tan fruit. This tree originated in Africa and Madagascar. They are wide spread through the tropics. There is a close relative from tropical Americas on also the islands. 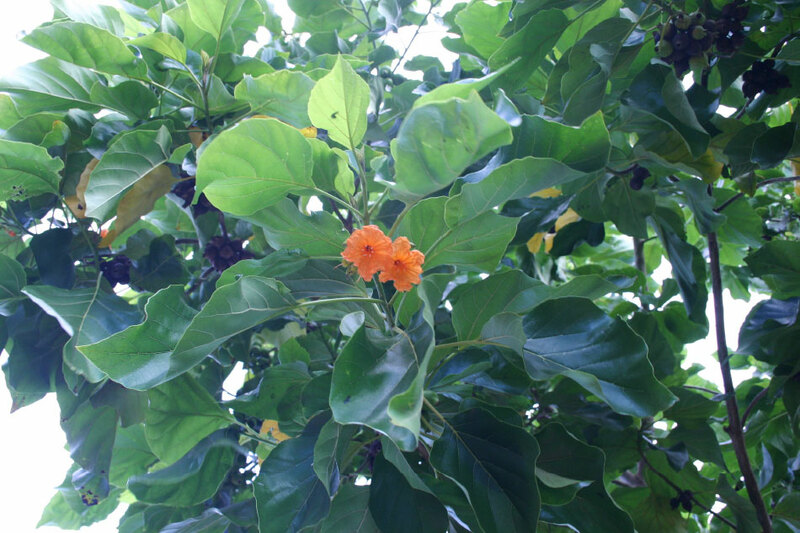 It has darker orange flowers, fuzzy leaves, and white fleshy fruit. The Hawaiians used the flowers for lei and medicine, and the leaves for dye. Early Hawaiians certainly brought kou with them as one of the canoe plants since it is such a highly esteemed wood. They used the aged leaves for a warm brown to red dye for kapa. Wooden food bowls, cups, dishes and calabashes were made from the preferred kou wood which did notimpart a resinous flavor to the food such as koa and most other native woods. The flowers were used for lei and young girls especially were fond of lei kou.The tasteless seeds were eaten in times of famine or occasionally by hungry children. The leaves were used to stain fishing lines a light tan color. Hawaiians considered kou as one of the best woods for carvings along with the natives koa and milo, and the Polynesian introduced kamani.